You start out with a whole wheat pita. First, you use a butter knife to spread a tiny pit of pesto around the pita. No need to go overboard, a little bit of pesto goes a long way! You then mash half of a small avocado and place it on top of the pesto. Then, sprinkle the pita with a little part-skim mozzarella. 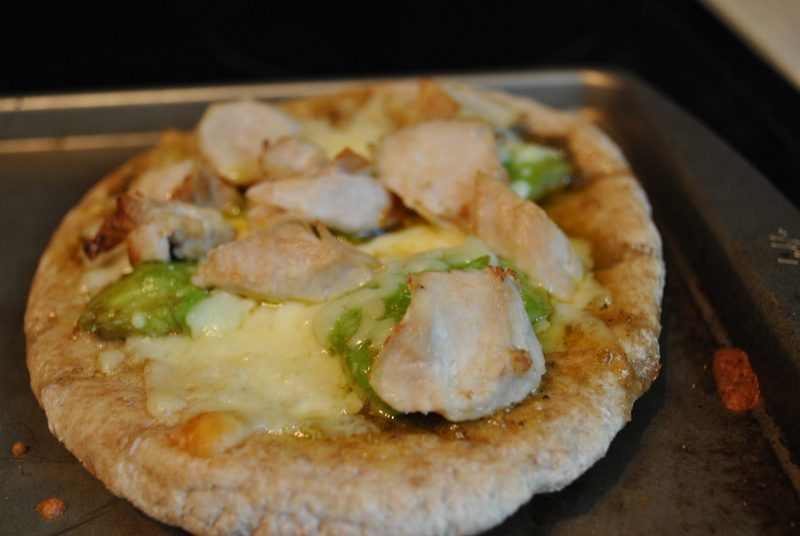 You can add whatever other toppings you like, but I use pre-cooked chicken strips for some extra protein. Before I put it in the oven on a cookie tray, I lightly drizzle it with olive oil. My favourite flavour is red pepper olive oil, it gives it a little kick. It only takes about 15 minutes at 350 degrees fahrenheit. Can you believe this savoury meal is just under 400 calories? I’ll take it! How do you make your favourite treat healthy? Tags: bariatric protein, bariatric recipes, bariatric surgery, benefits of avocado, gastric bypass, gastric bypass recipes, good fats, health, healthy pizza, how to eat what you love, how to make pizza healthy, meals under 400 calories, pizza, pizza under 400 calories, protein pizza, weight loss surgery, wls, wls recipes. Bookmark the permalink. This pizza looks amazing! I am excited to try it out! To switch it up from pesto, you could also try some olive oil with fresh garlic and fresh tomato.